David escaped Gath and went to a cave of Adullam. All the misfits of the world heard of his plight and how he was there, so they all gathered around him — about 400 in total. Then David went to Mizpah in Moab and asked the king if his father and mother could come and stay with him until he know what God would do with him, which the king agreed. However, the prophet Gad told David to go to Judah, so David went to the forest of Hereth. Saul learns of David’s whereabouts and takes officials to the tree of Gibeah. He rants about how everyone has conspired against him — even his own son (Jonathan) made a covenant with David. It’s a pity party to say the least. Doeg the Edomite (1 Samuel 21:7) tattles that he saw David go to Ahimelech the priest at Nob who gave David provisions and Goliath’s sword. Saul sends for the priest and his family and asks him why he conspired against him. Ahimelech said he merely did what he was asked, knowing nothing of the inner workings of politics between them. David is a loyal servant to the king. Why wouldn’t he inquire of the Lord for him? Saul orders the priests killed because, in his mind, they conspired against him as well. The officials refused, but Doeg agreed to do it. 85 priests were killed and Nob was destroyed — all who lived inside it. One priest escaped named Abiathar. He fled to David and told him what happened. David felt responsible for the deaths and promised to protect Abiathar. Written about Doeg, David is angry, but knows God is just and will deal with Doeg. He knows Doeg is a disgrace and evil, God will bring him down, and the righteous will know God is not his stronghold. David trusts in God’s unfailing love, praising Him and hoping in Him. 6) Part personal question. My answer: Saul is a madman. Saul is throwing a pity party and, blinded by his own pride, kills innocent people. When Saul finds out the truth about the priest, he still accuses him of wrong doing and acts on this knowledge — killing them. How often do we do this as well? Throw a pity party, twist things in our minds — what others do or say — and then don’t believe the truth and still hold grudges against others? It’s definitely a warning to us to not get so caught up in ourselves and our conceived hurts and injustices, to find out the truth, and to act on the truth — not distort the truth. 7) Part personal question. My answer: David is sympathetic to the priests and blames himself for their deaths. He knew Doeg was evil and would tell Saul about him, but he did nothing (he probably thinks he should have killed Doeg — a sin of itself — to spare the priests). He also knows he lied to the priests, which made them vulnerable when Saul shows up, and they have no idea that Saul hates David and wants him dead. David takes responsibility for the deaths of the priests. He knows his actions indirectly resulted in their deaths. He offers to protect the one remaining priest. Taking responsibility here for your role in how life plays out is the lesson I see here. So often we dismiss how our actions influenced others or caused this or that friction between others and deny it’s our fault. We need to be more like David — compassionate and willing to admit when we caused something as well as take into account how the lies we tell affects others. 8 ) Part personal Question. My answer: David understands that God will deal with evil and those who are good, God will bless. My views are the same. God is the judge not me, and evil He allows for His own purposes, and I trust God will deal with it. I also know if you obey the Lord, He will bless you, and you will flourish. What a fascinating look into the mind of a madman and how people will twist whatever they hear to suit their needs. Saul is throwing a pity party and, blinded by his own pride, kills innocent people. It’s scary because we all do this on some level, especially when we read into situations or don’t have all the information. But here, when Saul finds out the truth about the priest, he still accuses him of wrong doing. How often do we do this as well? Don’t believe the truth and then still hold grudges against others? The second lesson we see is how our lies affect others — even white lies. We never know how it plays out. It’s always best to tell the truth no matter the consequences than tell a lie and watch the consequences explode. Great analysis of David and Saul here and great contrast. You gotta love the writer here who perfectly juxtaposes these stories for us so we can see how to act and how not to act. God is good! What a whirlwind of a life David has led! David rose to fame killing a Giant, married the king’s daughter, defeated the Philistines, avoided repeated attempts on his life, and said goodbye to his best friend, Jonathan, and his family and began a life as a fugitive for who knows how long. Then David had a brief, but intense period of backsliding, a dramatic turn to the Lord, and deliverance from a life-threatening situation. What was the cave of Adullam? Most archaeologists believe that the cave of Adullam was not too far from the place where David defeated Goliath, in the hills of Judah. Psalm 142 is David’s discouragement in the cave of Adullam. Psalm 57 describes David as the Lord strengthened him in the cave and prepared him for what was next. Who were the people in the cave of Adullam? First, David’s family came to him. This is a precious gift from God because previously all David had was trouble and persecution from his father and his brothers (1 Samuel 16:11 and 1 Samuel 17:28). Now they join him at the Adullam cave. God called an unlikely and unique group to David in the Adullam cave. These were not the men David would choose for himself, but they were the ones God called to him. They were distressed, in debt, and discontented with life. These are the people you want around you: those who come to you when you are in distress — not when life is going great. These men all came to David when he was down and out, hunted and despised. Once David came to the throne, there were a lot of people who wanted to be around him. But it’s the 400 men in the cave who are the loyal ones. These are the people who come to Jesus — the forlorn, the distressed, the ones seeking something more from life. This was not a mob. This was a team that needed a leader, and David became that leader. God doesn’t work through mobs. He works through called men and women. This was a solid beginning to a rebel army if David wanted it. An unprincipled leader might make these 400 men into a gang of rebels or cutthroats, but David did not allow this to become a rebel army against King Saul. David made them into the kind of men described in 1 Chronicles 12:8: Mighty men of valor, men trained for battle, who could handle the shield and spear, whose faces were like the faces of lions, and were as swift as gazelles on the mountains. What do we learn from the men called at the cave of Adullam? David was the one anointed by God to be the next king over Israel, and he became Israel’s greatest earthly king. But just as much as God called David, God called these four hundred to come beside David. God leads through a called and anointed man (Noah and the ark, Moses and Egypt). God rarely calls that man to work alone. David needed these 400 men, even if he never thought so before. There are those called to lead and those called to support the leader. Each is just as important as the other. 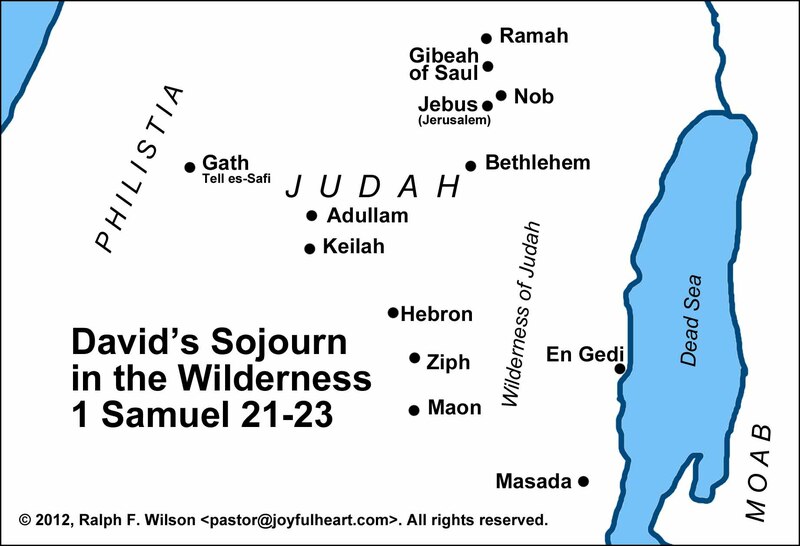 David took his parents to Moab because his great-grandmother Ruth was a Moabite (Ruth 4:18-22, 1:4). He wanted his parents to be safe in whatever battles he may face in the future, and he feared Saul might retaliate against him and kill his parents. David doesn’t know the whole story. He knew he was called and anointed to be the next king of Israel, but he had no idea how God would get him there. David had to trust and obey when he didn’t know what God would do. Gad counseled David to leave his own stronghold and to go back to the very stronghold of Saul. This probably wasn’t what David really wanted to hear, but he obeyed anyway. David had to learn to trust God in the midst of danger, not on the other side of danger. When we see Saul with a spear, we know he’s out to kill. He calls David “the son of Jesse”, refusing to acknowledge his achievements. In his fleshly, self-focused world, everything revolved around Saul. He became paranoid and whiny, and he led through guilt and accusation. He lied about Jonathan, and thus constructed elaborate lies and conspiracies in his own head against him. Here’s an ambitious man out to take full advantage of Saul’s paranoia to advance himself. We last saw him in 1 Samuel 21:7 in Nob, at the tabernacle at the same time David came there. He knew how to divert Saul’s anger and suspicion from himself onto the priests. Saul continues in his paranoia, thinking everyone is out to get him. Here we see the effect David’s lies had on Ahimelech (that ultimately resulted in his death). Ahimelech told the exact truth. When David came to Ahimelech, the priest questioned him carefully (Why are you alone, and no one is with you, 1 Samuel 21:1). Instead of telling Ahimelech the truth, David lied to him. This put Ahimelech in a very vulnerable position. Ahimelech was unaware of the hatred Saul has for David, partly due to the lie David told him (1 Samuel 21:2). Saul has turned to murdering in cold blood. Many scholars think Saul is angry at God for abandoning him and stripping him of his crown and, being unable to carry out his anger on the Lord, strikes out at the innocent such as Ahimelech and his family. This was the worst act Saul will commit. To their credit, Saul’s servants feared God more than Saul and they refused to murder the priests. Doeg, who was not a Jew but an Edomite, didn’t hesitate to murder the priests and their families. How did David cause the death of Ahimelech and his family? David’s mere presence with Ahimelech that made Ahimelech guilty in Saul’s eyes, and there really wasn’t anything David or anyone could do about that. David’s lying to Ahimelech made the priest vulnerable before Saul.i. David’s lies did not directly kill Ahimelech and the other priests. But at the very least, he kept Ahimelech from dying with greater honor. If Ahimelech knew of the conflict between David and Saul, he could have chosen to stand with David and die with greater honor.ii. We know from both 1 Samuel and the Psalms that David turned his heart back to the LORD and asked forgiveness after his lies to Ahimelech. David was restored, but there was still consequences to come of the lies, and now David sees those consequences. David could not do anything about the priests who were already murdered. He confessed his guilt in the matter and sought forgiveness from the LORD. 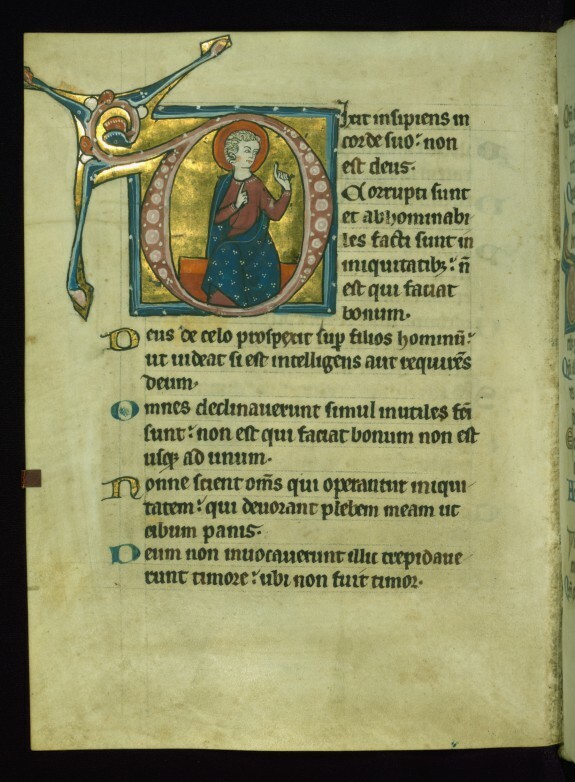 Now, all he can do is minister to the need in front of him – Abiathar, the surviving priest. Though the condemnation of Doeg in this Psalm is strong, we sense it would be stronger in light of the mass-murder he committed. Yet this is David’s contemplation upon the incident, a careful examination of the root and end of Doeg’s evil. Doeg took pride in his lies and murder. David earnestly believed that Doeg’s way would fail. God’s goodness would outlast his evil. It’s true that Doeg was a mighty man, but that was nothing compared to God and His never-ending goodness. When David wrote the goodness of God, he used the word El to refer to deity instead of the more common Elohim. Some commentators believe the use of El emphasizes the strength and might of God. David mentions the destruction and deaths that came from what Doeg reported (1 Samuel 22:18-19). Some people love evil, and some people love to lie. Doeg fulfilled both aspects. He loved the destruction his devouring words brought. Boice believes Doeg was just as calculating as evil as there is reason to believe there was a gap in time between David visiting the tabernacle at Nob and Doeg’s report to King Saul. “He knew he had a piece of valuable information and kept it to himself until it would best serve his interests to divulge it.” How many times do we do this? Because the goodness of God endures forever (Psalm 52:1), Doeg and his kind would be destroyed forever. When the coming judgment against Doeg happens, the people of God will notice it, and it will cause them to honor and revere God. It will also make them laugh in satisfaction at the destruction of such an evil man. This is righteous joy — something acceptable. This is not laughing at people because you are better than them. Note it is the righteous that learn from this; not the evil who don’t care. What can we learn from Doeg? We often are drawn to evil and lying because we fail to trust God can and will work through goodness and truth. We lie to ourselves, saying that we have to lie, do evil, or deceive because it’s the only way. It’s never the way. 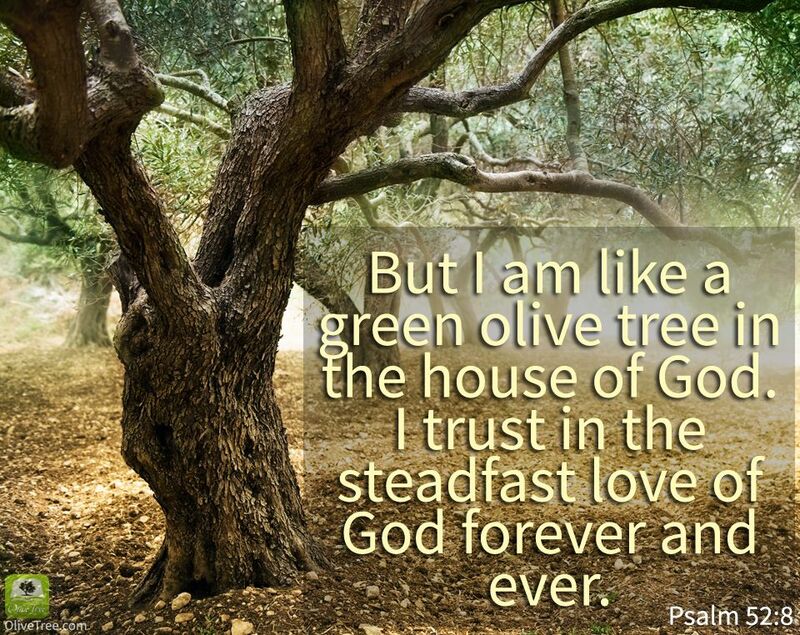 Psalm 92:13 may indicate that there were trees at or near the house of God. “Hope” is also translated “wait”. Our strength is to wait on God and His will. Therein lies our honor. What does Psalm 52 show us about David’s mindset? What do we learn from Psalm 52? 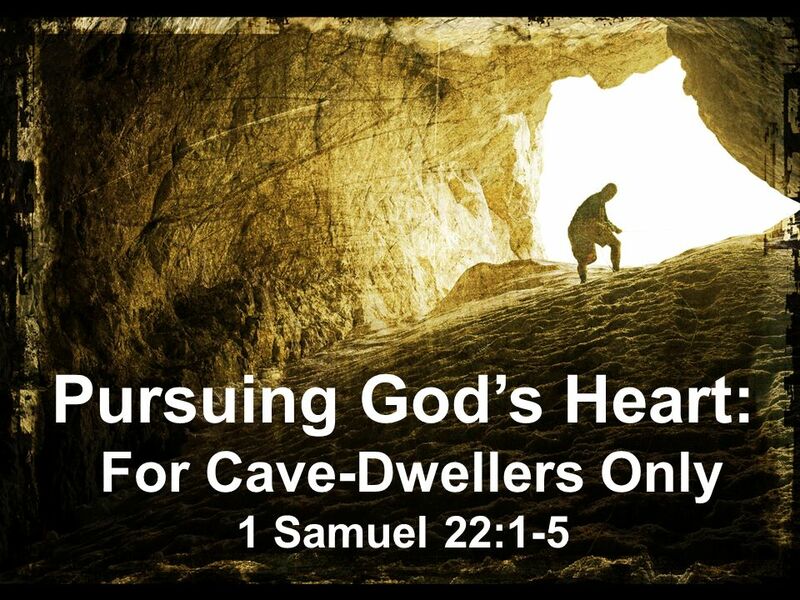 We can be in the cave, but still have David’s unwavering faith, trust, and peace.